I just posted part of this in the "Hurricane Proofing My Garden" thread, but this needs its own post cuz I need help fast! 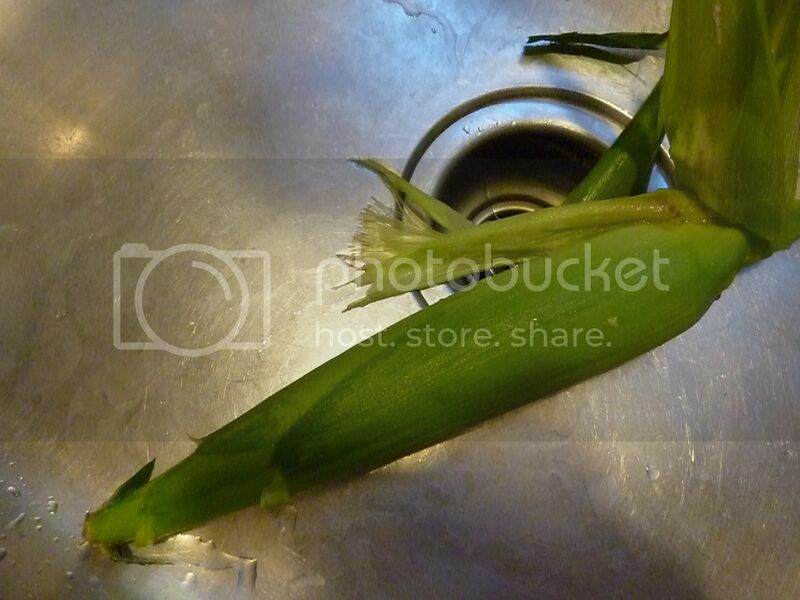 Long story short, my garden is now a lake and the wheat looking things on the top of the corn are broken off from the recent hurricane and I am thinking that the kernels/husks won't grow anymore due to that, so I picked 2 ears of corn that were growing. They were definitely not large enough yet, but the silk was brown and dry, and I am going on vacation, and I figured it will probably be dead, rotted and bug infested by the time I got home, so I'd give it a shot. Anyway, here is my experience with the first ear: When I broke it off, there were all these little tiny bugs on it. Ew!!! I HATE bugs. 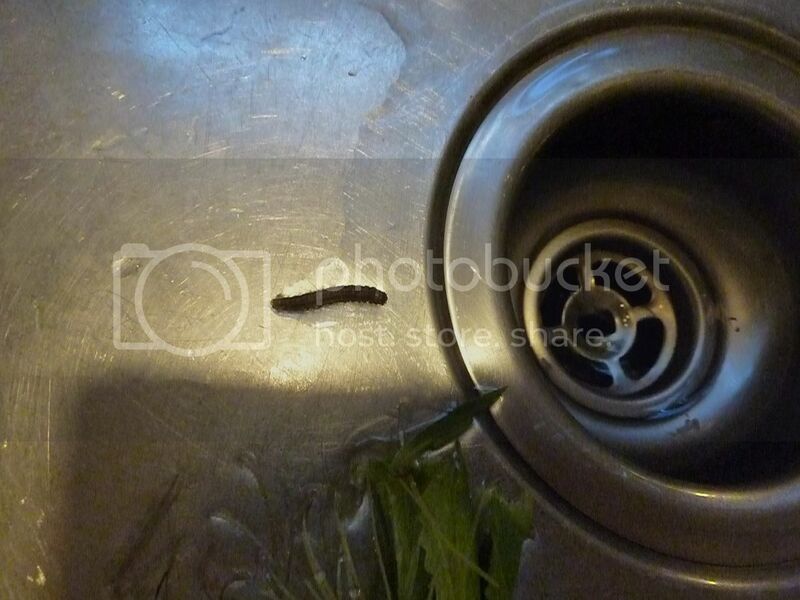 I brought it in the house and put it the sink and just ran the sprayer over and over and over it. A spider came out! EEK!!! I am petriefied of all spiders, but I was able to wash it down the drain. 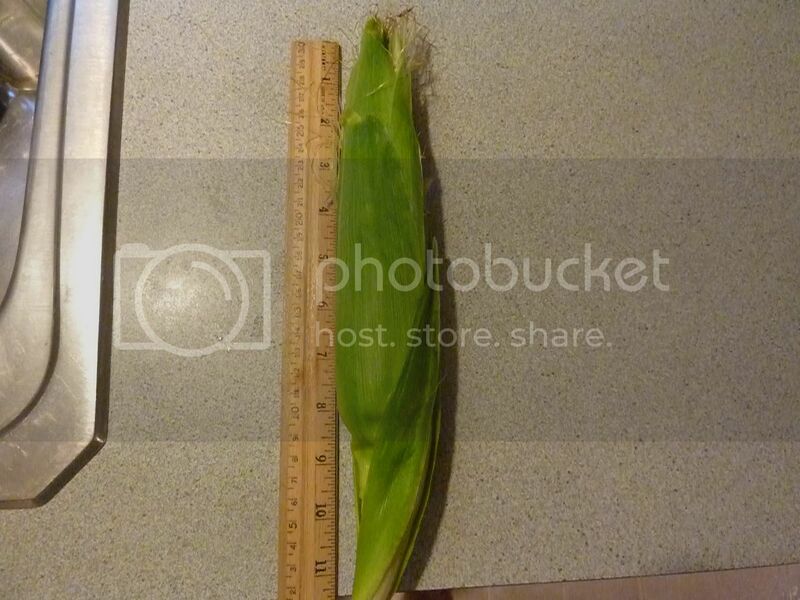 It looks like all of the bugs are off of it, so I opened it up, carefully, and no bugs, but the kernels stop maybe 1/2 inch from the top, but also, they are not as plump as when I buy corn in the store. 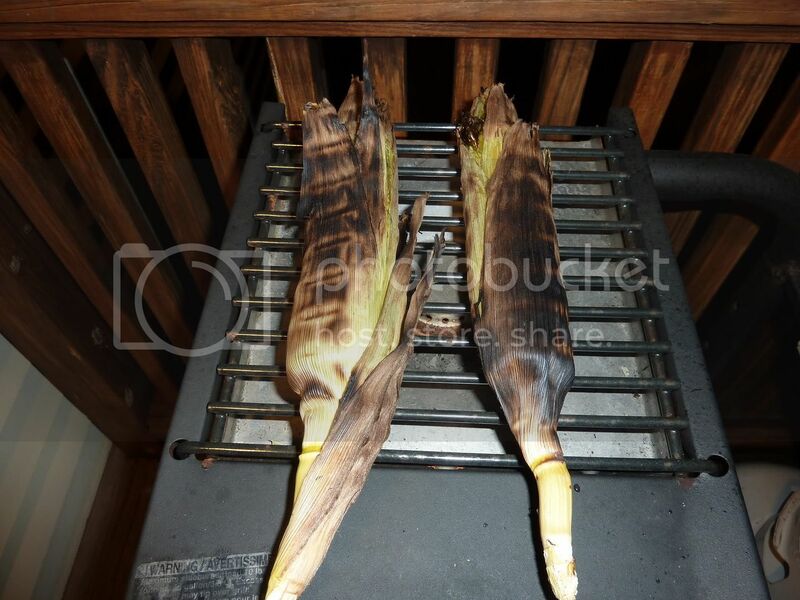 Of course, the corn husks in the store is much bigger as well. So I throw it in the sink and I notice like this small hole in it. When I peeled that layer back, this is what was underneath! Ewwwwwww!!! On the other side, it looks like another ear was forming off of this one??? See the silk coming out of the top? Was it going to form another ear? So after rinsing it off good, I opened up the top, and this thing was in there!!! (where is the getting sick emoticon?) 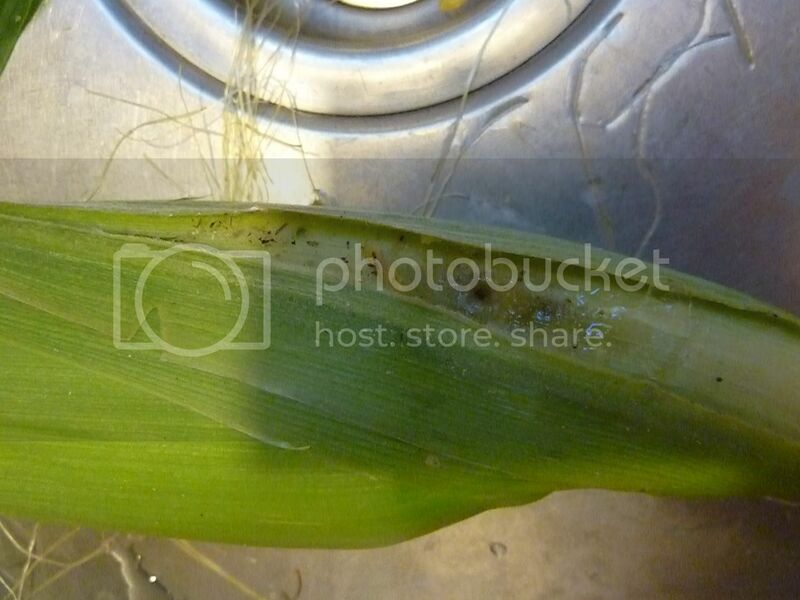 It was in the silk around the unformed part of my corn!!!!! So is it safe to eat??? Even though wormy disgusting gross things were on/in it? I have it soaking right now, and I'm gonna grill it - if you think it is safe??? I am so grossed out right now, I am nauseous and my hands are shaking like a leaf. Like I said, I HATE bugs. Also, do you think I should let the rest of the corn grow more or do you think it will die in the lake it is now in? Technically, it should have at least a couple weeks left of growing, that would be about 30 days since the silk appeared. And I did try to pollinate it myself by rubbing off the tops in my hand, grinding it up and sprinkling it over the silk. Then again, I have absolutely no idea if I even did that right? Oh also, what is this white stuff???? I'm not a corn grower but they look good to me. Cut off any bug infested parts and you should be fine. If the tassels are brown than they are probably ready, another way to check is to peirce a kernel if the juice inside is milky they are ripe. 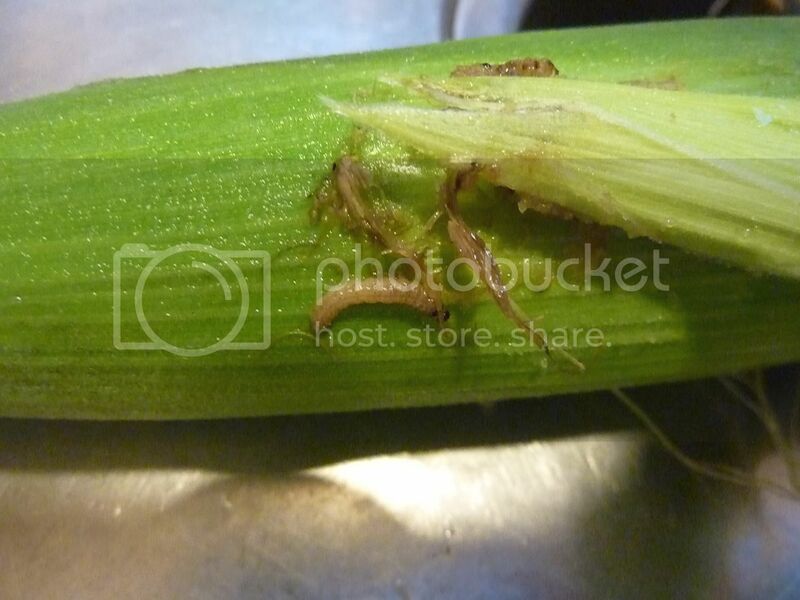 I don't know much, but from what I see in your pic's, I would clean it real good to rid of the bugs, trim the top to see if the stalk looks heathy and grill it with some garlic butter . Maybe someone here will be able to help you a little more with the health of the corn but other than the exposed parts, the silk looks pretty good to me. It sure looks good to me! Can I come over for dinner? I'll bring some homemade butter! Dealing with corn earworms is just a part of the process of growing corn, IMO. 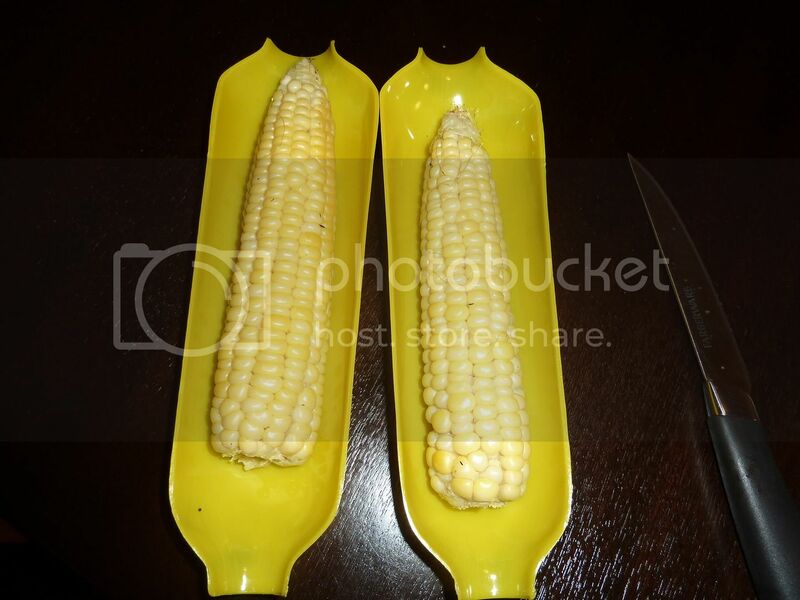 When I was a kid, shucking the corn for dinner was one of my chores. I hated the worms, too, but after awhile, learned just to flick them off into the grass and get my work over with, so I could go play. I haven't grown corn for 30 years or so, now, but as I recall, it isn't at all unusual for the kernels on the tip of the ear to be undeveloped. It doesn't affect the quality of the corn. Not for me, anyway! I'm one of those anti-chemical Gardeners on this forum. 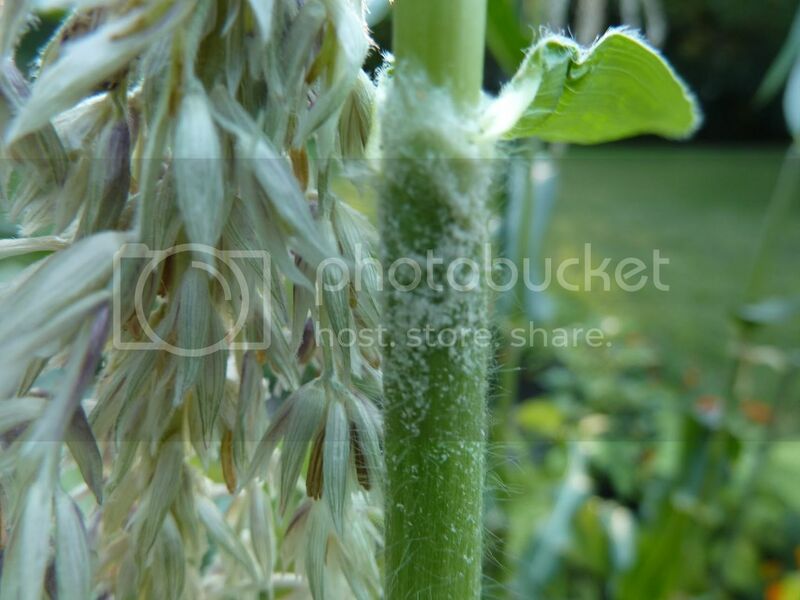 So I clicked on this thread thinking you'd SPRAYED your corn with some horrible pesticide. 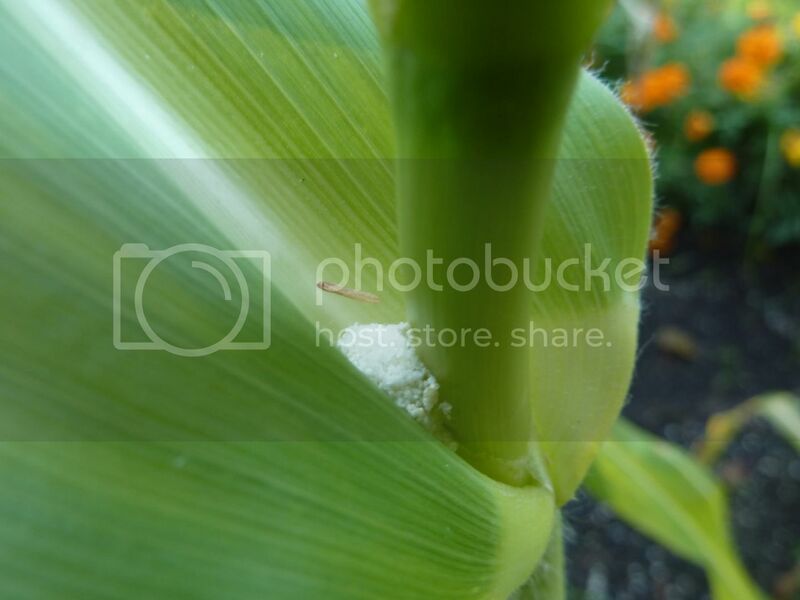 To my way of thinking, the presence of those bugs indicate what a wonderfully SAFE corn you have. The spider was merely PROTECTING your corn from thugs. 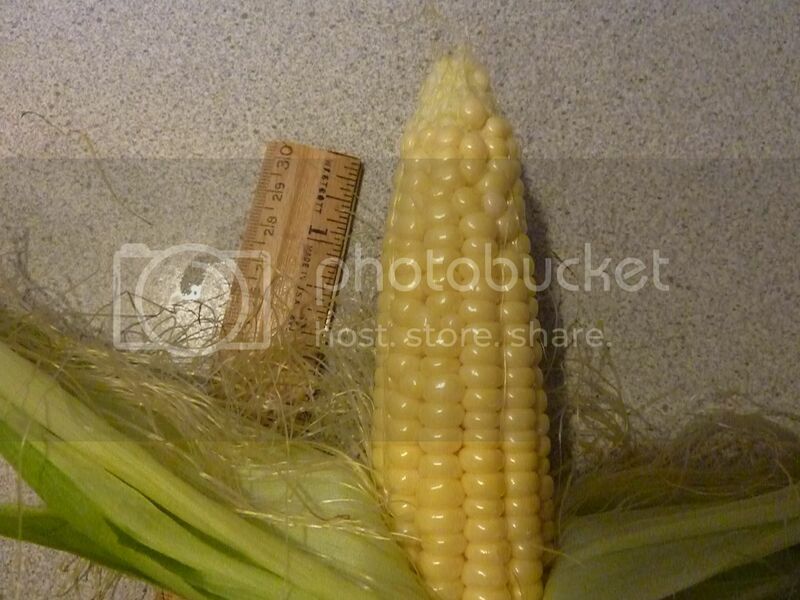 The kernels look pretty well filled to me, though I'm by no means an expert. Soaking for about 5 minutes in salty water is a good way to encourage hidden bugs to come out. 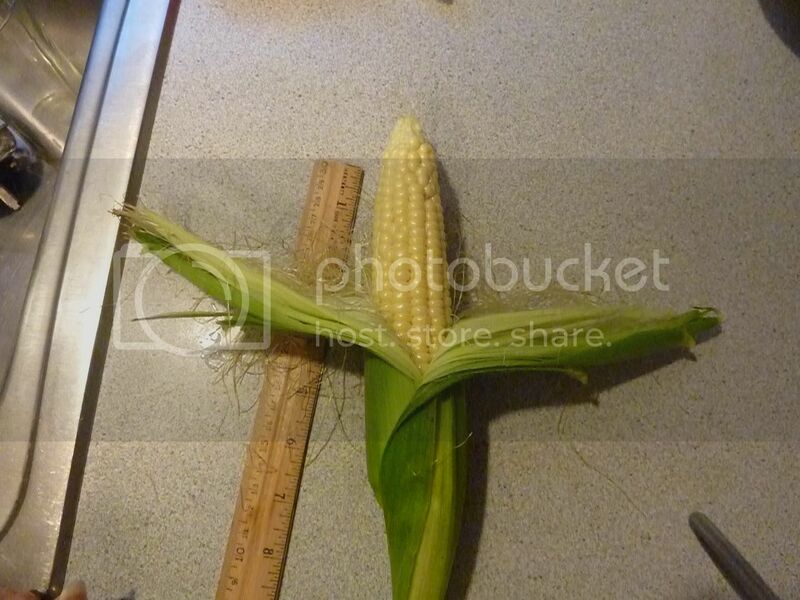 The little side shoot may or may not have developed into a baby corn. my kids consider them a bonus. I'll leave it to the experts to answer about the water logged condition. I do think the corn would get watery and lose some of the flavor though. I have found that if you freeze them as soon as you pick them, they keep their flavor into next week. For longer storage, most people recommend blanching first. The powder in the leaf crotch is most likely pollen. I hope you get over the bug thing, or gardening wont be much fun. Thanks for your quick responses all! Anyway, I went ahead and took your advice and ate it. And right now, I'm still alive! Then eaten...by me this time! It's half the size of the corn I find in the store, but it was still tasty! PS - Unfortunately, I will NEVER get over my bug thing...just a phobia. You should have heard my scream when I opened it up and saw that wormy thing! It was even worse when the spider came out! But I'm still (carefully) gardening! I'd like to suggest that you start your "I'm going to work on my insect phobia" campaign with spiders. Spiders are 99% helpful in the garden. Even the very few spiders that have bad reputations (e.g., black widow spider, brown recluse) are still positive factors in the garden. Spiders catch evil, plant-attacking insects in their webs and kill those plant-attacking insects. They then eat the plant-attacking insects, ensuring that the attackers will not reproduce. If you have a healthy population of spiders, your plants are well patrolled. The rule at my house (and I started with a pretty STRONG...feeling, we'll call it ...about spiders) is that spiders in the garden and outside are OK, spiders in the house are not OK. If DH finds the indoors spider first, he likes to put one on a paper towel and release it outside. If I see it first, frankly I'm not sure what I'll do, since it depends on many things: how close am I to the vacuum cleaner? how much energy do I have? how big is the spider? is it moving quickly or just sitting there? is one of my cats ready to pounce on it, saving me the effort? etc. But I am most definitely not "live and let live" for spiders in the house. I strongly recommend soaking fresh-picked produce in salted water if there's a chance of multiple critters in it, then another soak in plain water, swishing the water around both times as "encouragement" to the villains, telling them to exit NOW. Congratulations on the yummy corn! You said it well Cynthia, We live by this rule too for all bugs in the house. I hear you on the larvae phobia. 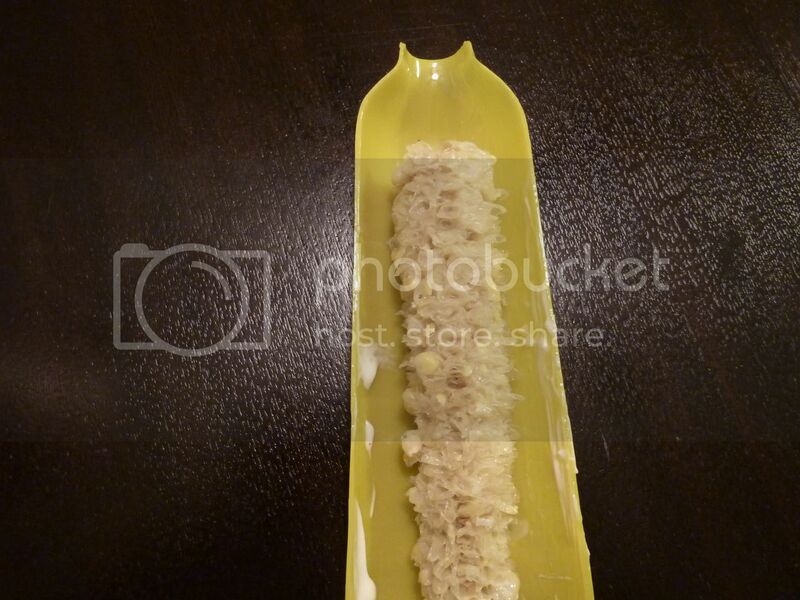 I got grossed out just looking at your photo of the corn borer. (I think that's what they call it.) I'm so bad that I won't grow brassicas, which in my experience are the most prone to those nasty little green worms, or most root crops like potatoes, because I can't see what's going on, larva-wise, while they are growing. It's a phobia that gets better with time, though. Although I don't like to touch cut worms, wire worms, millipedes, tomato worms, and grubs, generally preferring to scoop them up with a trowel or a handy twig, in a pinch, I can now grab them quickly and toss them over the fence or into the street. My rule is that bugs don't belong in the house. I can ignore almost all outside spiders and flying insects, but anything in the larva category really freaks me out. If the veggie was under water - DON'T eat it!!!! Lettuce, herbs and leafy greens cannot be cleaned. Root vegetables can be eaten if they are washed, peeled and COOKED. As for spiders, I run into their webs every day and I just brush them away. However, now that cynthia mentioned the brown recluse, you need to know that those things can cause a lot of problems if they bite you. I still have a scar from 13 years ago where I was bitten by a brown recluse. the poison eats your flesh. My whole lower leg and ankle got really infected. So, Maybe I will look at the spider in the web before just brushing them away. Safe? Yes! Those worms are edible too. I know, we don't want to eat them, but they would not hurt you. Just clean up that corn and enjoy. 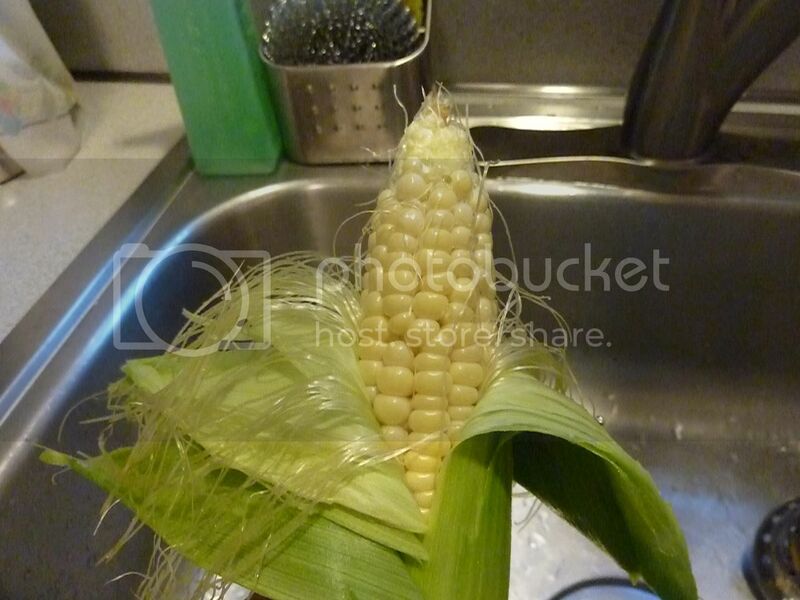 I just husk it, cut off any damaged kernels, wash it, and throw it in boiling water for a few minutes. Ummmmm Yummy! I think I am going to go pick some corn. By the way, that corn is pollinated very well. It is not a bit unusual to have an inch or less of cob on the top that did not get pollinated. Not a problem. You have beautiful ears. Small size may be due to the variety? I'll bet it was tasty? What about baby corn? Isn'tt that early picked corn? Is it safe to eat this partially eaten corn??? Tonight? TUBULAR HEATER - ADVICE NEEDED ASAP !